Next Friday, 22.4.2016 and Saturday, 23.4.2016 there will be a very special charity walk. Several walkers , from around Chania and Kissamos area will do a charity walk: 100 km of walking in two days for a charity supporting Breast cancer care. You can support being a cheerleader , when they will pass our area or/and support them with donation. saturday, 3 p.m. Platanias centre, Bossa Nova bar(Gerani) 3.45 p.m., Menta (Maleme) 4.15 p.m., Haridemos (Tavronitis, end of the walk) 5.15 p.m.
We’ve joined together to raise money for charity. Your donation can really help us smash this goal. 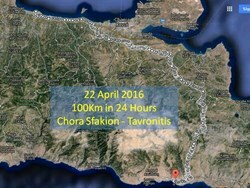 We are attempting to walk 100 kilometres across the width of Crete in 24 hours or less over April 22nd and 23rd 2016. The route follows the withdrawal route of the allied soldiers after the Battle of Crete in May 1941, and as it is the 75th anniversary in 2016 we thought we would commemorate it in our own special way. We will be walking the opposite way to the withdrawl route from Chora Sfakion to Tavronitis. 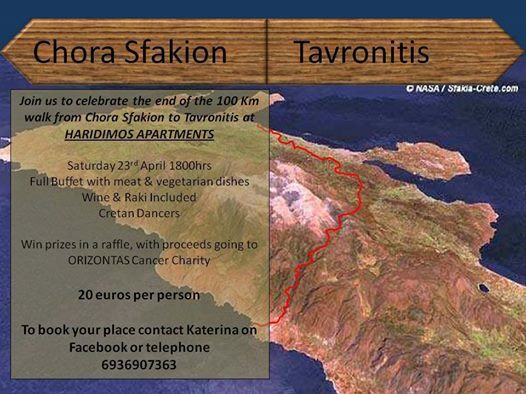 Thank you for the post at ‘Kissamos News’ about the 100km charity walk. The more people know about it, the better.